I recently purchased some exciting new colors of paracord from Supply Captain and I thought I would use one of those colors to tie one of my favorite bracelet designs by TyingItAllTogether. 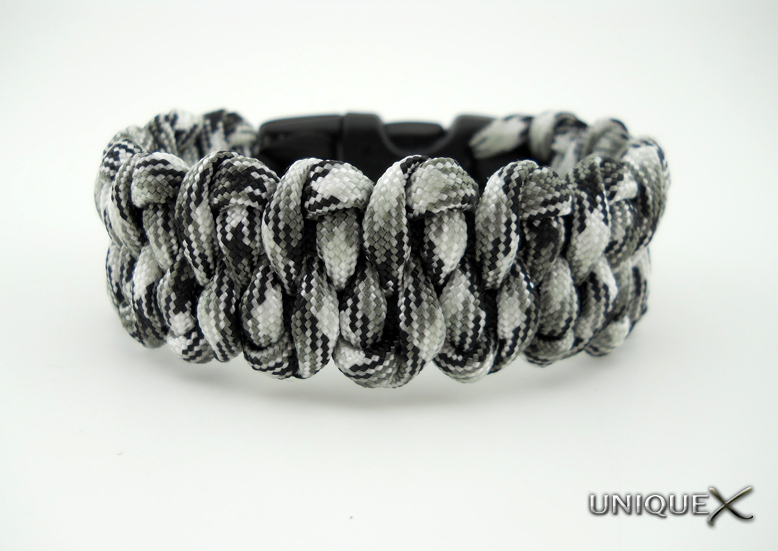 The color I chose to use is called Urban Camo and I used approximately 6-7 feet for the main color, you will also need a core strand, I used approximately 2 feet of black. To tie a Dragon's Tongue bracelet using Buckles is pretty much a matter of what looks best to the one who is tying the bracelet. I chose to start by tying two Cow Hitches leaving the black (2 feet) strand in between the Urban Camo (larger strand). And then I simply followed the instructions from the video by JD at TyingItAllTogether until I reached the desired length of my bracelet. 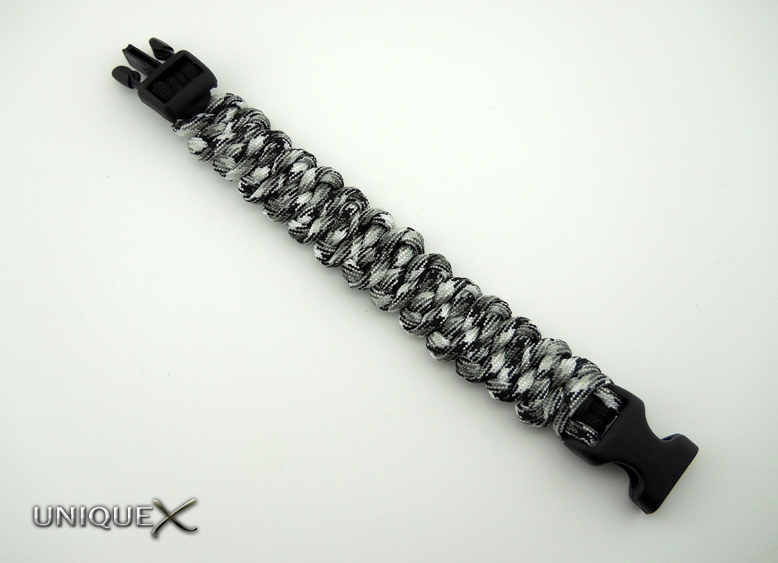 From there you will need to remove the excess paracord and secure cord to keep it from coming uncompressed, there are a couple of ways to accomplish this. Keep in mind that at this time you will only be removing the excess Urban Camo (main) strands, leave the black (core) strands in place. 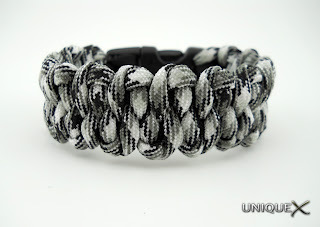 Use a Quilting Pin (or whatever you have on hand that will substitute) to hold the Urban Camo paracord in place. I used a Wood Burning Tool to cut the strands and melt them in place at the same time. 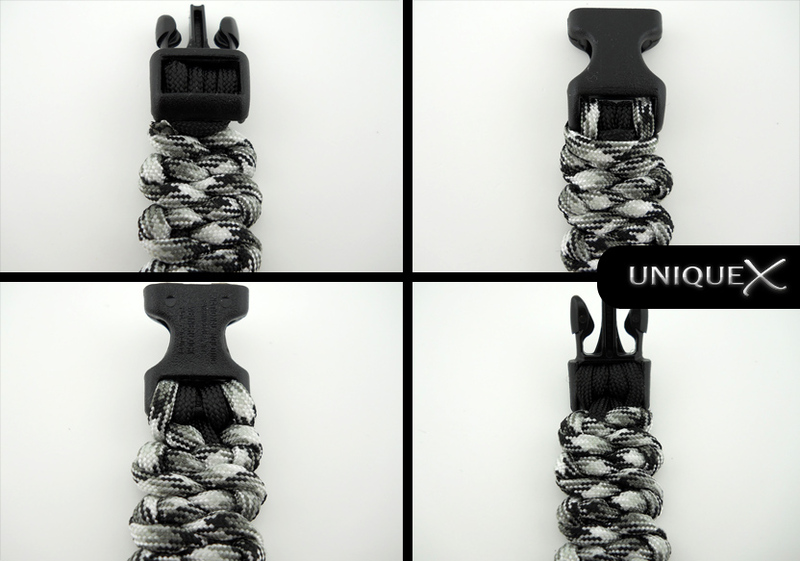 You can use scissors to cut the paracord and then use a lighter to singe the ends, then you can use a matching color thread to secure the Urban Camo paracord in place. Once the Urban Camo paracord is secured in place you can attach the opposite end of the buckle with the black paracord. I wrapped it around the buckle twice and tied a Cow Hitch by joining the ends together and hiding the joint inside the buckle. To learn how to join two pieces of paracord, Wishbone1138 has a video showing the technique. Great to know that you have purchased some exciting new colors and your instructions to tie Dragon's Toungue bracelet is very nice. I am hoping to create one in the near future. It will be a great addition to my knowledge in paracord bracelet tutorial. Thanks for sharing! @Jude: Thanks for the support, I've found that some aren't finding the links to videos so with this post I decided to place the video(s) directly on the blog to show others where I learned to the design. The Dragon's Tongue is a great design by TyingItAllTogether and has been out for over a year, but it's fun to comeback to the older designs because they are just as good now as they were when they were originally posted.